Each Thursday I like to join Kimberley at Cosmos and Cleome and single out a plant which has tickled my fancy that week. 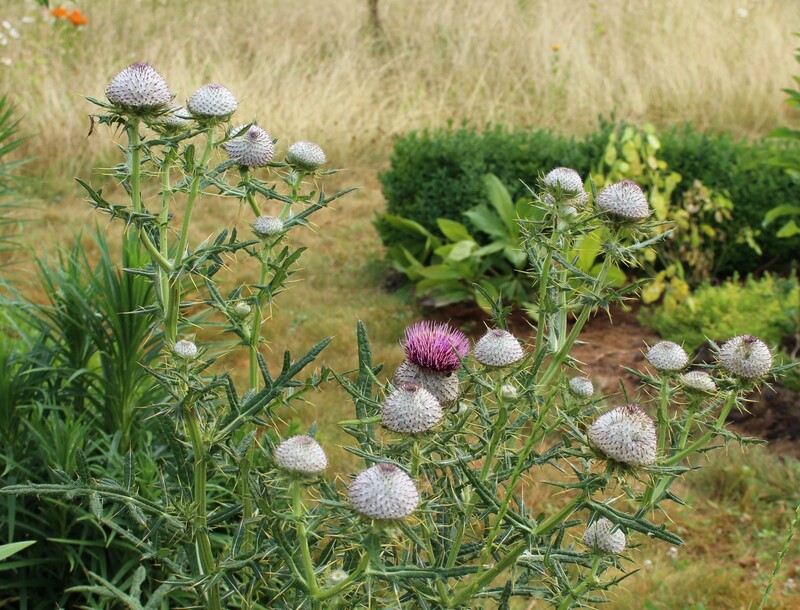 For the most part my choices have been on the respectable side but this week I’ve gone back to the dark side and chosen the wooly thistle (Cirsium eriophorum), a plant which if anything should be kept far, far away from your fancy since direct contact will definitely NOT tickle. 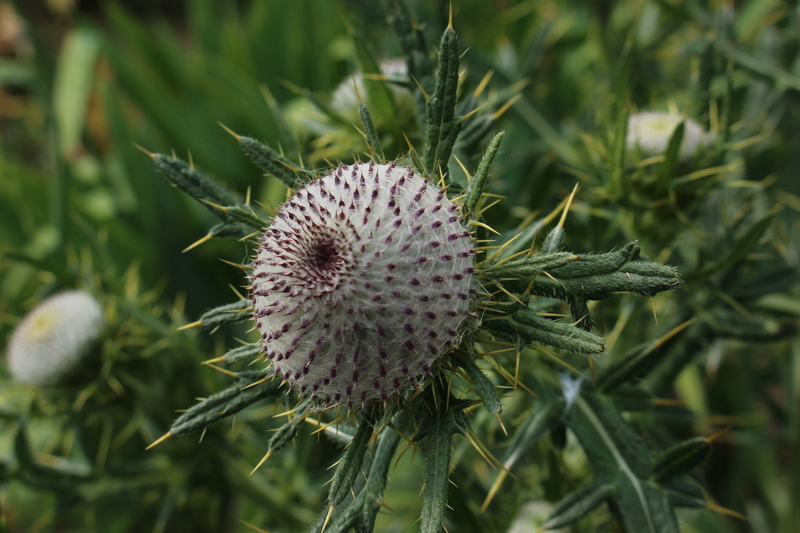 Cirsium eriophorum, the wooly thistle, with its first bloom opening in late June. Despite its cute common name, the wooly thistle is probably cursed by many a gardener and farmer throughout its native Europe. I don’t think many a gardener here or there would go through the trouble of finding seeds through a seed exchange, sowing them and nursing the plant for three years, and then briefly enjoy it’s heavily armed flowers for a few weeks until it set seeds and died… but I think it’s absolutely fascinating! A baby picture only a father could love. Wooliness studded with purple tips and all so nicely geometrical! Who knows if I’ll replant the seeds once mama thistle is gone, she is a bit of a hostile presence after all, but she’s very welcoming to the bees and ants which swarm the flowers. She’s also very popular with a group of weevils which have poked their noses into the wool and I’m sure laid eggs while nibbling the flower buds. Weevil grubs eating thistle seeds is probably not the worst thing to have and even with them there will likely still be more than enough seeds produced. I will completely understand a less than enthusiastic review to this week’s choice. Please feel free to just smile politely and then later shake your head, I’ll understand. Cirsium eriophorum today with its fat wooly flower heads. Please also feel free to visit Kimberly and enjoy what she’s selected for this week. I hear it’s a delightfully pure Shasta daisy, and I’m sure it’s far better suited for vases and placing behind the ear than this thing! 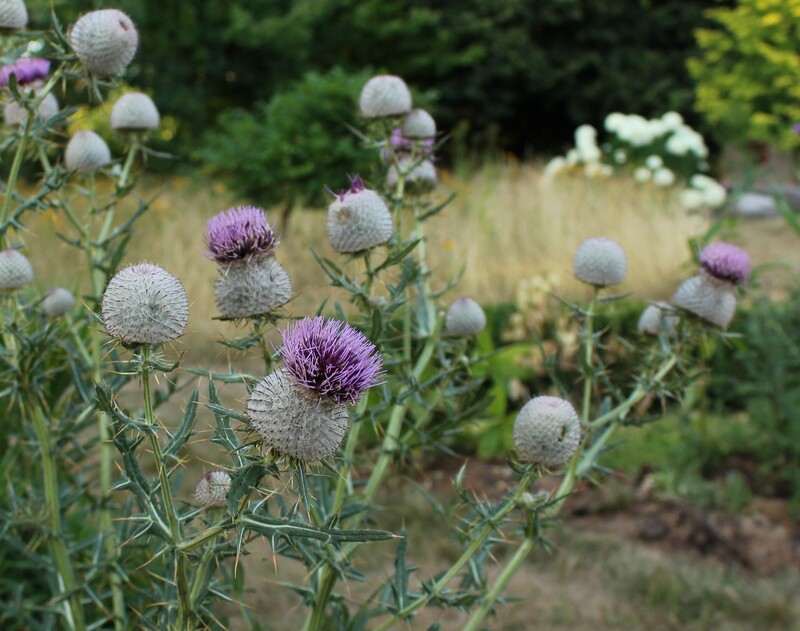 This entry was posted in summer, thursday feature, Uncategorized and tagged garden, thistle, thursday feature. I love the color of thistles…particularly on the side of the road. I like them in the meadows, but not in my garden. AND THEY ARE SEEDING EVERYWHERE. I don’t know if it is the goldfinches spreading them, but a mature plant is hard to pull out with those deep tap roots. Long handled lopers are my choice for cutting out unwanted plants, the biennial types will not regrow from the roots and the lopers keep you from having to really get in there near the spines. I’m surprised they are such a problem for you this year, you seem to be in such a residential area unlike my yard which is surrounded by fields and weedy areas, so they always blow in here. If I don’t mulch an area they always show up, but you seem on top of that. Maybe birdseed has something to do with it, but I think the finches always eat where the feeder is, I never see them taking seeds elsewhere. The thistle here has a tap root which laterally sends out a lot of little thistle plants. Even the ones two inches tall hurt if pulling without gloves. Our medium is filled with them, like the dandelions that were a problem in Spring. Now the medium has included a wave of Blue Chicory and Creeping Charlie. The city is supposed to take care if this area, but has not in recent years. It looks pretty with all the wild flowers, but it is tough for gardeners like me that do not use chemicals. It’s hard to battle weeds when there’s an unending seed source just upwind. Your thistle sounds like Canadian thistle which is the only one I know of which spreads by runner. I wouldn’t let this one anywhere near my garden and if any seedling looks remotely like the Canadian type (I think it has glossier leaves with a different shape) I rip them out immediately! I think it’s on most state’s noxious weed lists. It is Canadian Thistle unfortunately. There is no way to pull it since the tap root is like a foot or more long. I am not even sure if RoundUp works on it. I have poison ivy from the property behind, and only a commercial herbicide kills that. It is also invading the garden since the neighbors had the 40 foot mother vine removed. We will see how long this spiny guest is allowed to stay. I may tire of the spines by August and pull the whole thing! You’re right it grows everywhere here. Farmers try to remove any thistles where sheep will graze as it can harm their stomachs I’m told. I grow its more friendly cousin the Echinops. I never had much luck with echinops but that was in another garden. I should really give them another try! 🙂 you would be surprised by all the excuses I can come up with on the spot! A plant that is generous to everyone but gardeners. Goldfinches love thistle seed. The goldfinch do enjoy pulling the seed heads open and leaving a fluffy pile in the garden, it’s always entertaining to watch… But sunflowers also work and are much more people friendly. Yes, I did smile! It’s a beautiful plant, but like the Teasel I wouldn’t want it in my garden. I hate prickles! I regret my decision just about every time I receive a stab to the hand or arm, but I think overall it’s the roses which have drawn more blood! 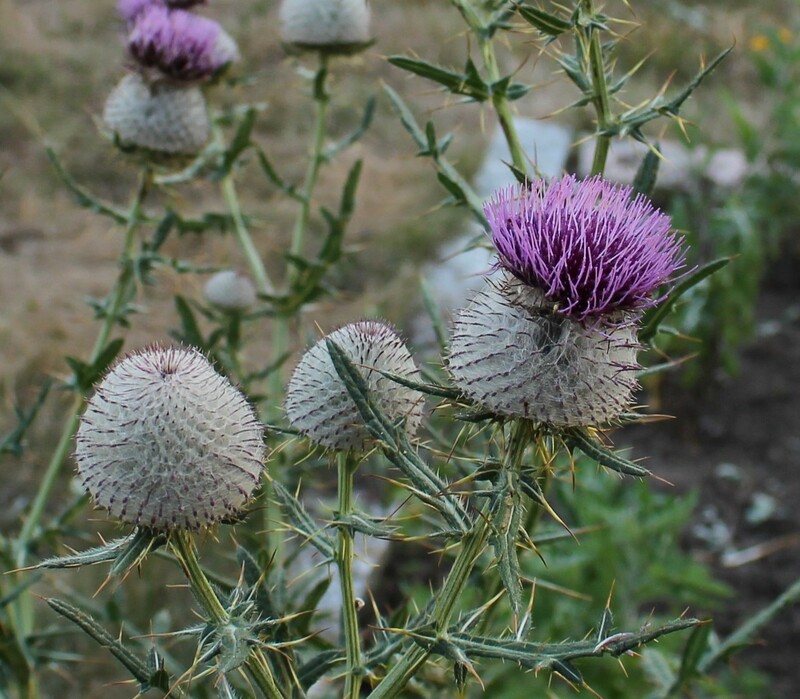 Thistles are “interesting” but definitely not for everyone… they’re also not a plant I need to have growing every year, but they’re fun here and there. Check the meme out, it’s nice focusing on one plant which might otherwise go unnoticed.